There is now a working well at the OIH center! We give praises to God for another answered prayer. This will change the lives of many people in Bombardopolis. Theo Dewind spent hours drilling for days starting from early mornings until dusks, taking small breaks in between. His dedication and hard work made this project such a success. OIH has been blessed to have Theo be part of OIH’s mission in spreading the encouraging news of Jesus Christ’s love by providing the daily essentials to those who are less fortunate See more pictures. 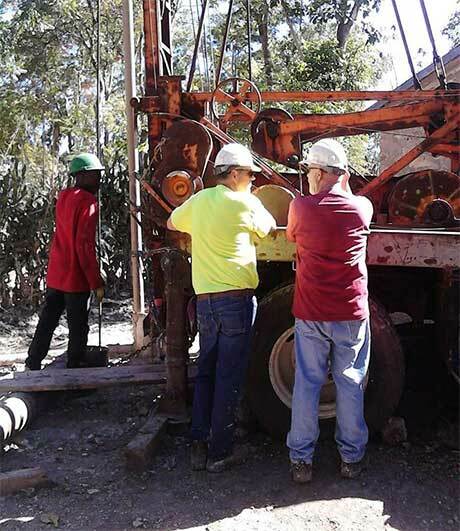 Tony spent more than two months away from his US family to devote an incredible amount of time drilling and teaching the locals in Bombardopolis to operate the drill. 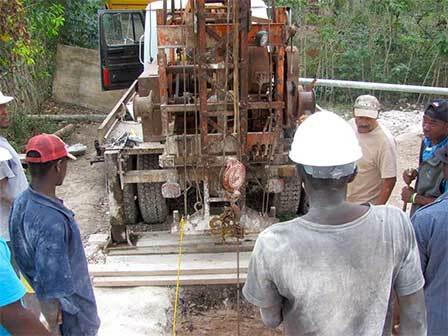 It is OIH’s goal to pass on the knowledge and skill to the locals in order to continue providing clean drinking water in Haiti. It will enable the locals to have valuable skills for employment outside of Bombardopolis. 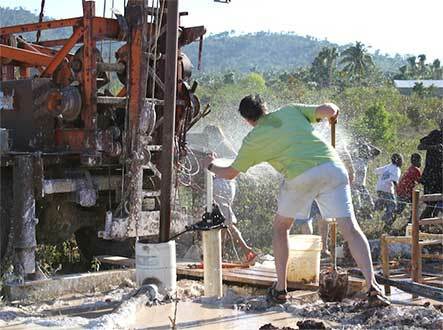 Jon and Randy from Washington have volunteered to continue operating the drill in collaboration with the locals. Their dedication has been a blessing to the community. As of January 2016, a total of 6 functioning wells are now available in Bombardopolis. 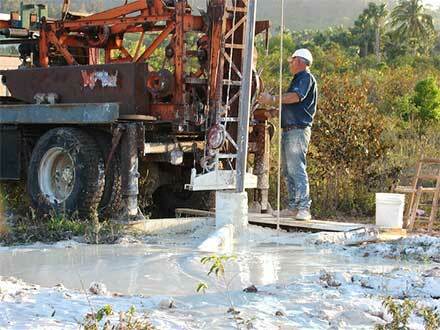 Currently, drilling has begun at Sister Leo’s property, located approximately 3 miles from the OIH’s property. Sister Leo and her husband are pioneers in Bombardopolis, starting an orphanage in the midst of severe poverty and in one of the remote places of Haiti more than 50 years ago. Before OIH’s missionary house was built, she opened her home to many short-term OIH missionaries for many years. We are grateful for her generosity to OIH and blessed to help in her efforts to aid the children of Bombardopolis. The Well Rig arrived in Bombardopolis safely. There were many onlookers and volunteers from the neighborhood during the drilling. 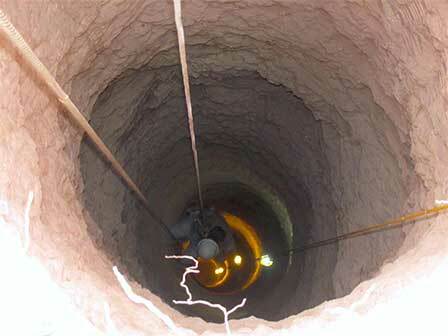 After reaching approximately 100 feet down, part of the machine broke and fell in the hole that they were working on. This caused a 3-day delay until part of the machine that fell was retrieved. Theo and his team managed to drill down to approximately 250 feet but water was still not in sight. Theo and Jean returned to the U.S. a week after, putting the project on hold to prepare for the Missionary team that will be arriving in Bombardopolis at the end of March. 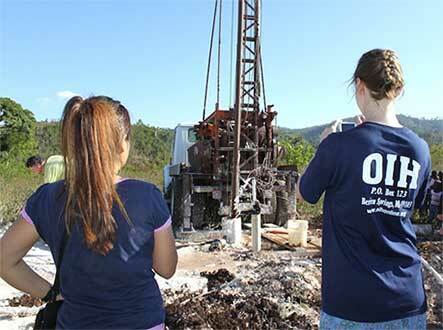 Upon arrival at the OIH Center this month, Theo and his team will resume with the Well Project. It is estimated that the water source will be located at around 300 feet.